How do I install Samsung PC Studio for my Phone? My current phone contract expires soon so I’m looking closely at my options. I’m happy with the way Cingular’s service works in general, so I’ll likely stick with them, which narrows my field of choices a little. I’m incredibly happy with my experience in using the 2125 and won’t be switching away from Windows Mobile anytime soon. 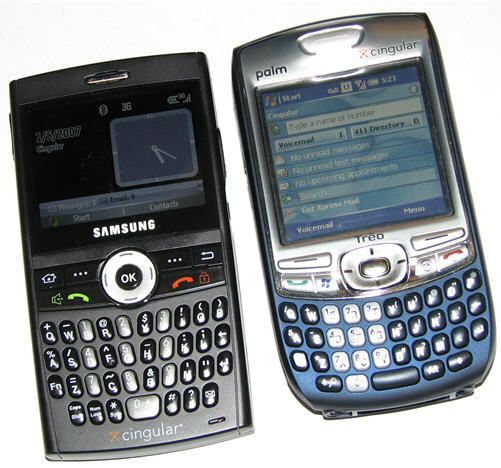 Of the available options from Cingular, I’m leaning toward the Samsung BlackJack, which is another Smartphone. With Cingular launching the Treo 750 today, I’m also taking a close look at that phone. Of lesser concern to me is the size of the phone, although if it doesn’t fit in my pants pocket, I’ll be annoyed. Palm loaned me a 750 to test out, so one of the things I did was compare it to my existing 2125; compare it to a BlackJack; and compare it to the Treo 650 available to Verizon customers. Here’s a photo montage of those comparisons. I’m not a big SMS guy, primarily because my brain doesn’t think well in T9 mode. Palm made SMS on the Treo 750 more like an instant messaging client, by making SMS conversations threaded. I love it. I can send a message, respond, get a response and follow the conversation even if the messages are several hours apart. Having a full keyboard gets me to use SMS, having it work more like email or instant messaging with conversation tracking makes it easy to follow what’s being said. You get a SMS thread for each conversation you’re having. The one trick I noticed in this is when someone you message sends a new message instead of replying. The new message starts a new thread even though the message was really part of the previous conversation. I’m chalking that up to a limitation of SMS at this point, but hopeful Palm can figure out a way around this in the long run. The screen resolution on my Audiovox SMT5600 is 220×176 if you tilt the screen sideways for a normal 4:3 view. For some reason, the preferences on the device are set to display video at 160×120, which doesn’t make full use of the already tiny screen real estate. I transfer most of my video content to my phone using Windows Media Player. The software detects the phones preferences and automatically sizes everything it transfers at 160×120, leaving a black border around the available screen space. Diane Dumas of Pocket PC Magazine recently tipped me off to a solution. Take your video full screen by pressing the * key on your Windows Mobile 2003 SE SmartPhone.